This manual will take you in AllShareVideo software administration panel and guide you to its functionality and settings. Right after login you get to AllShareVideo administration panel home page. It’s important to know that site administrator can access user and admin mode with only 1 login. If you are at www.yourdomain.com/admin just remove “admin” from the url to access user mode and manage admin profile, contacts, channel, etc. Let’s come back to administration panel home page. The left side menu is visually divided into 3 main blocks: user generated content (videos, channels, user profiles, user payments), content settings (system settings, numerics, interface, content and content moderation) and additional functionality (banner ads). The right top question mark links to an appropriate page in the product WIKI space. 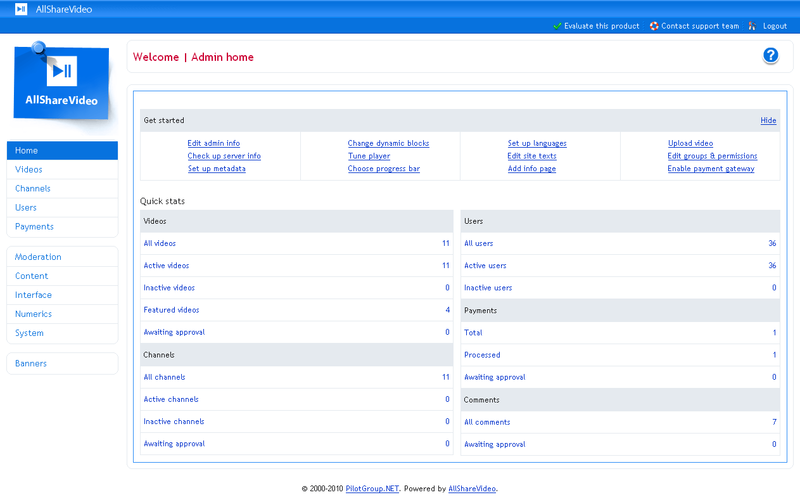 In the centre there are get started and quick stats sections. Get started block contains links to sections which are advised set up before the website is available to site members. The block can be hidden later if required. Quick stats displays quick stats in videos, channels, users, payments and user comments.